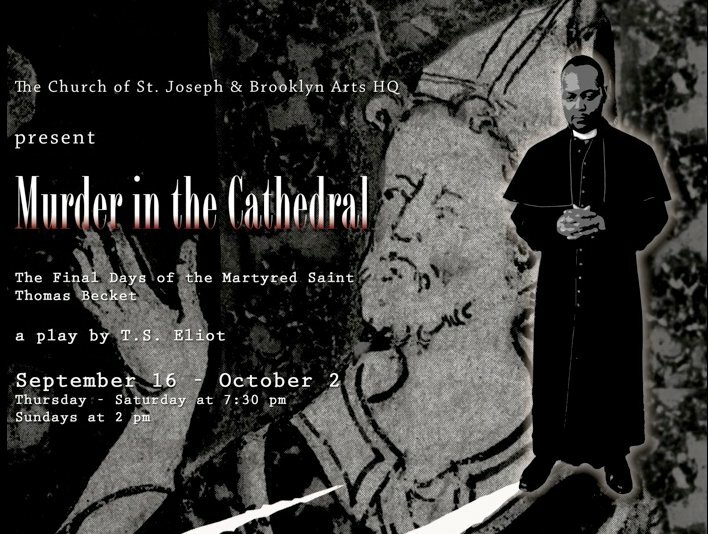 "4 Stars...In the booming resound of St. Joseph’s, Eliot’s portrait of rebellious Archbishop Thomas à Becket’s final days becomes truly sermonlike—your attention will wander, following the echo into the vaulted ceiling, or the starkly lovely choral sections (composed by Dave Malloy) will put you into a trance." "The director, Alec Duffy, smartly uses his vast, upside-down boat-shaped space lighted by golden candle flames to create an atmosphere that is as authentic as it is otherworldly. What stands out most is the grand scale of the nearly 100-year-old Church of St. Joseph — no theater has ceilings this high — and the echoing boom of the actors’ voices gives the poetry a lift. A choir of 15 women adds lush vocals accompanied by a score (including organ) by Dave Malloy...the production has the odd effect of seeming far away in distance but near in sound. The almost uncanny quality captures the sense of standing in awe of something ineffably vast but that still speaks to you. In that way, the space really serves, and perhaps deepens, the play."